There are select few films that can claim they were part of a movement that changed the course of national cinema. Shiri (쉬리) is such a film. With the change from a military to democratic government in the early 1990’s, and the resulting relaxation of censorship, Shiri proved to be one of the first films to tackle the relationship with North Korea that wasn’t represented wholly negatively. 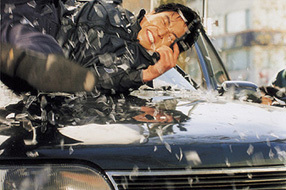 The film also proved that Korea had highly capable directors and actors, employing stylised and kinetic action sequences that had been the staple of 1990’s Hong Kong films and utilising them to express Korean socio-cultural anxieties. As such, Shiri became the biggest box office hit of 1999. Furthermore, the film gained international recognition promoting Korea as a country – and a film industry – to watch. 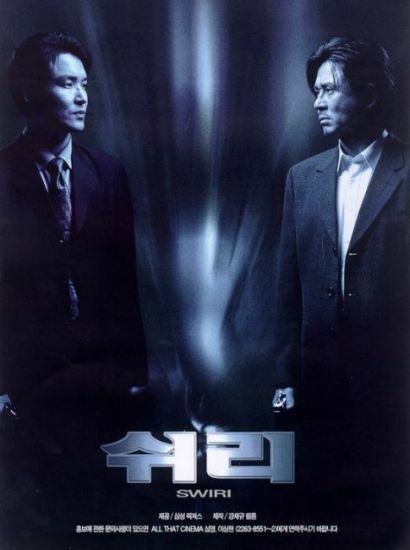 Agents Yu Jong-won (Han Seok-Kyu (한석규) and Lee Jang-gil (Song Kang-ho (송강호) work for the South Korean intelligence agency. Widely respected as the best in the agency, they ultimately fail to protect an arms dealer assigned to their care. The precision and perfection of the assassination leads to only one suspect – North Korean sniper Lee Bang-hee (Kim Yoon-jin (김윤진). Her return is a surprise as Hee has not been active for years after she assassinated a number of high profile government officials. Complicating matters further, a small band of renegade Northern commandos led by Park Mu-young (Choi Min-sik (최민식) are en-route to the South, amid the backdrop of a football (soccer) game aimed at promoting ties between both people. Agents Yu and Lee are charged with finding and stopping Bang-hee and her compatriots, and uncovering why they have emerged to reek havoc once more. Director Kang Je-gyu (강제규), who also co-wrote the screenplay with Jeon Yoon-soo (전윤수), continually deconstructs the notions of ‘north’ and ‘south’ as oppositional (themes which he would later expand on in the seminal Taegukgi (태극기 휘날리며). Indeed, the title of the film ‘Shiri’ is the name of a fish that swims in the waters between the two countries, completely unaware of the political situation yet living in harmony. The film opens with the brutal military training regime Bang-hee must endure in the North, which are equally horrifying and dehumanising. Rather than representing the assassin purely as a monster, Kang Je-gyu also constructs empathy as she is forced to comply with barbaric demands. After she has infiltrated the South, empathy is invoked further as Bang-hee is a recovering alcoholic with social relationships, even managing her own business, conveying that precious little separates her from those in the South. Her fiancee is the unaware Agent Yu, and their union represents the reunification of both countries more succinctly than any treaty possibly could. Agent Yu must locate Northern terrorist Mu-young, who serve as mirrors of each other in their desire for reunification, albeit under different banners. During one of their confrontations Mu-young reveals his unbridled rage with the South, yet his reasons are not based on political rhetoric – rather, his jealousy of the high standard of living and the decadence within the country fuels his hatred, and in doing so conveys empathy towards his misguided violent attempts at reuniting the regions. While the politicians try to spur reunification through sport, it is ironically the ‘hero’ Agent Yu who destroys the only real way in which the countries can be unified, emphasising that neither side is inherently ‘good’ or ‘bad’ but misguided. 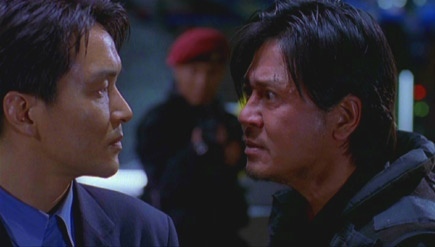 The actors all give good performances despite the tendency of ’90s action films for 2-dimensional characters. Such character development is generally limited in order for north/south relations to be at the forefront of the narrative, however the representation of the romance between Agent Yu and Bang-hee is touching and reinforces that the divide can be overcome with love. Choi Min-sik is by far the most talented and intense actor in the film, and acutely conveys the anger and frustration of those living in the North. His unrepentant attitude towards violence drives the narrative forward at a rapid pace and provides the thrills that lead to the ultimate showdown. The action sequences are kinetic and enjoyable, although they are far removed from the balletic slow-motion action of John Woo. Similarly, the introduction of new water-based super-weapon CTX is somewhat silly, yet it reinforces the notion of the adaptability and free-flowing nature of water in which the Shiri fish inhabit. It is important not to understate the importance and influence of Shiri in Korean cinematic history. While it may not be a ‘perfect’ action film, it helped to insure not only that the national cinema had serious potential but also that a country that had struggled for years following the Korean War could be recognised for its cinematic output. The impact is still present to this day exemplified by the sensational 2009 TV drama IRIS which employed similar themes and motifs. Shiri proved that, while borrowing generic features from Hollywood and Hong Kong, a national cinema featuring national socio-cultural concerns was indeed possible and helped to form the foundation of a cinematic movement.